Praneet Soi, Notes on Labour, 2017, metal, wood, acrylic paint, acrylic sheets, laser-jet prints on paper, 16 x 8'. The latest in the museum’s series of exhibitions intended to stoke dialogue between contemporary artists and the institution’s archive begins with a large freestanding curved painting, titled Notes on Labour, 2017, installed in the foyer. The twisted figures in the composition lurch into a void. Perhaps this speaks to the show’s premise—for history to meet with the present, one must accept a certain degree of freewheeling association. 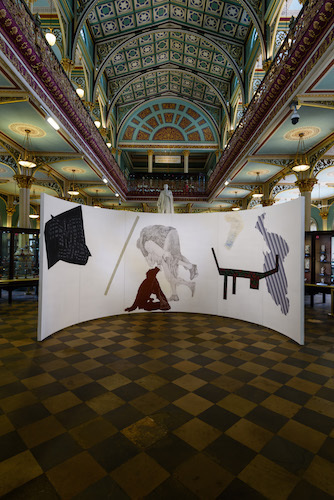 The absurdity here is in the juxtaposition: The lavishly refurbished colonial interiors of the museum house Praneet Soi’s investigations into the labor processes of the decorative arts. The show brings together works the artist has made in collaboration with traditional craftsmen from Kolkata and Srinagar in India, as well as Guangzhou in China, since 2008. Some of the resulting pieces—including the papier-mâché tiles of Tile as Archive, 2016—are prominently displayed and inscribed with dense floral Kashmiri motifs. Small handwritten labels accompany the inlaid flowers, indicating the names of the artisans’ designs in Urdu and English. In a designated room, the series “Astatic Machines,” 2011–, features printed sheets of acetate that may be placed on an overhead projector, and visitors are encouraged to trace the design thrown onto the wall with chalk. These include a selection of drawings by Lockwood Kipling from the Journal of Indian Art and Industry Vol. 2 (1888), which are part of the institution’s archive. This type of interactive installation engages audiences of diverse class backgrounds—rare for local contemporary art institutions. The individual objects on view act as notes, the pictorial equivalent of a series of quick recordings. This is where Soi reaches clarity—if the intention of labor and process is to reach finished products, here the work is deliberately left undone.